What is Wrong with the Oilers ?!?!? Tickets are $10 and include 1 drink. Get them on Eventbrite. The Oilers did not make the playoffs for the 12th time in 13 years. While they haven’t had the on ice success that we all want, it’s not from lack of trying. They have drafted players, signed free agents, changed coaches as well as general managers. So what is the issue? While I am by no ways a hockey scholar, I do understand organizations, leadership, and strategy and I think insights from that perspective might offer some insights on what is happening with the Oilers and why success has been difficult. 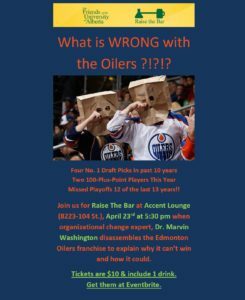 As this is by no means a time to only pick at all the faults of the Oilers, I will end our time with some insights on what the Oilers can do to get back to the playoffs. Marvin Washington is a full professor in the Alberta School of Business and Associate Dean of Executive Education. Dr. Washington’s research, teaching, and consulting focus is on processes of organizational and institutional change. He is the author of three books on leadership and organizational change. His most recent book is on developing your personal mastery (Leading Self before Leading Others with Stephen Hacker at Business Expert Press). Marvin has taught undergraduates, graduates, and executives during his 12 year tenure at the University. Dr. Washington has worked with a variety of organizations such as, Enbridge, AIMCo, Blue Cross, YMCA, Parkland Fuels, Syncrude, and SportChek, many ministries and departments in the Country of Botswana, Government of Alberta and the City of Edmonton. Raise The Bar is a program designed by The Friends of the University of Alberta Society to provide interesting, engaging learning opportunities that break down real or perceived barriers to education and connect the University and its faculty to the broader community. We’re raising the bar on the way people consume content.